Here's the pricing for DayBack Online, along with frequently asked questions. This includes Google and Basecamp calendar sources. To start a 30-day trial and see your own schedule in DayBack, start here (no credit card required): start a trial. DayBack for Salesforce is available on the Salesforce AppExchange where you'll find pricing and can start a 30-day trial in your own Salesforce org. DayBack for FileMaker Server (using DayBack in a browser or in WebDirect) is here. DayBack for FileMaker client (using DayBack in your FileMaker layout) can be found here. Past your order number, email, and registered to name into the fields provided and click "Activate". If your activation is rejected it may be that you included labels like "Email: " in your submission, or simply mistyped your order number. If none of this is helping, please don't hesitate to get in touch. Inviting Users and Managing their Access Rights. Note: Managing users is a bit different in Salesforce where DayBack picks up the permissions you've assigned in your org. Scroll down for Salesforce-specific instructions. 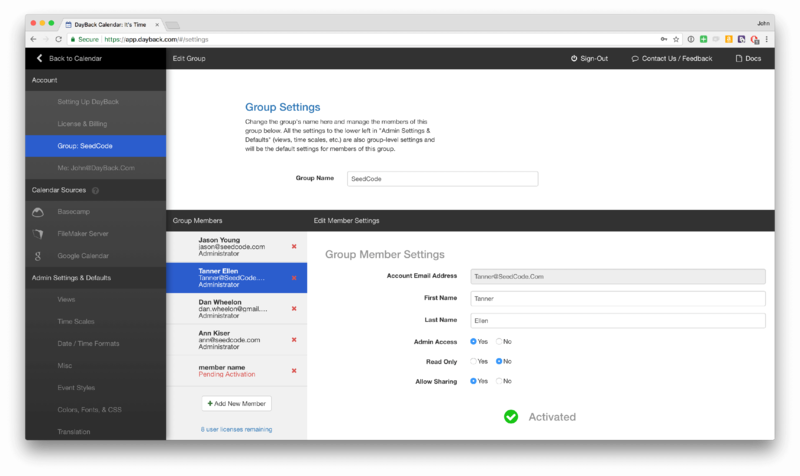 Once you've logged in as an administrator, you'll have access to the Groups section in Admin / Settings. There you can see all the users in your group and invite as many users as your license supports. You can also decide which users are also admins (you can have more than one) and which users have read-only access. Inviting New Users. When you invite a new user to your group DayBack will send them a short email letting them they've been invited and telling them the name of your group. The email also contains instructions for logging in using their email address and a new password created for them by DayBack. Once they log in they'll be able to change this password on their own Admin / Settings screen. Inviting Existing Users. If you add someone to your group who has already got their own DayBack account (perhaps they created a trial to check it out), they won't be given a new password but will be added to your group. Support for belonging to multiple groups is coming soon. The number of users you can add to your group depends on your license and you'll see the number available at the bottom of the "Group Members" column (where it says "8 user licenses remaining" in the screenshot above). Soon you'll be able to purchase more licenses from inside DayBack, but for now please get in touch and we'll add licenses to your account for you. When you install a licensed managed package in your organization from AppExchange, you purchase a certain number of licenses from the package developer or publisher. You can assign each license to a user within your organization. If you assign all available licenses, but would like to grant licenses to additional users, you can reassign a license or purchase more. To get more licenses, contact the publisher of the managed package. If you're using custom profiles, you'll need to teach DayBack which profiles are allowed to use it. To do this, search for "Visualforce Pages" from the Setup menu. Find "DayBack" in the list (click "D" in the list header) and click "Security" beside the DayBack listing. Add any profiles that should be able to use DayBack from the list at the left. 2. When you installed DayBack you chose to let users self-authorize or permit any admin-approved users to use DayBack. If you're using custom profiles your users may see an additional "insufficient privileges" error when trying to self-authorize: that is, they'll see the blue screen saying they need to authorize DayBack, but clicking the "authorize" button will produce a new window and an error. To fix this, search for "Connected Apps" from the Setup menu and click "Edit" beside DayBack's listing. Under "Permitted Users", change the value to "Admin-approved users are pre-authorized". Now make two additional changes to grant access to the App itself and the Tab. Both changes you'll make are under the Profile definition: grant access to DayBack in the profile's "Connected App access" and "Custom Tab settings". Note that you could also create a Permission Set for DayBack. Visualforce page access, Connected App access, and Custom Tab settings can all be managed there, so if you have a Permission Set scheme you already use, you can create an additional permission set for DayBack and assign that on a user-by-user basis. All these licensing options are available in the App Exchange. Visit DayBack's listing on the App Exchange and log in. Click on your name and select "My Account"; then select "More Actions" beside DayBack to see your account options.